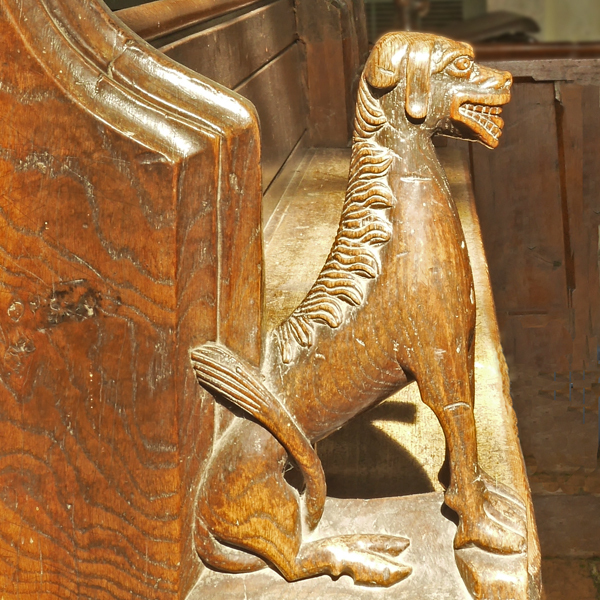 The earliest churches in England had no fixed congregational seating. 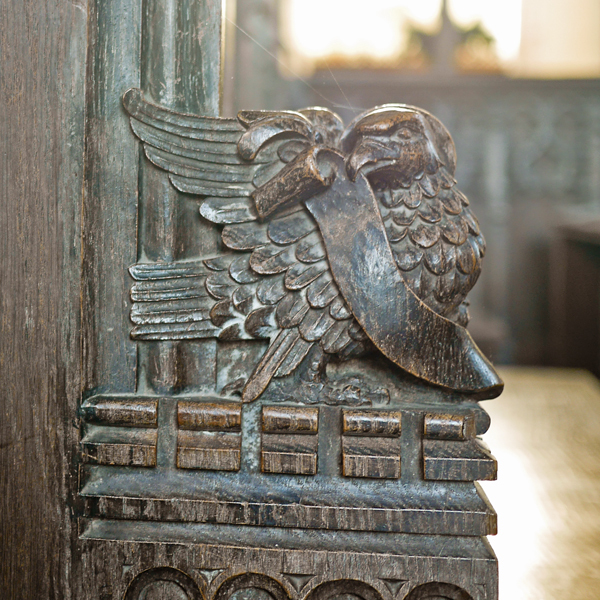 In a limited number of churches, there were stone benches running around the north, south and west walls, or even around the pillars. 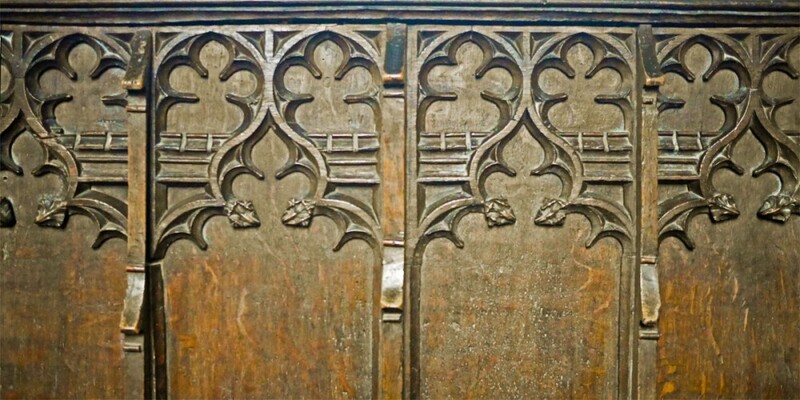 The weakest people would therefore have gone to the wall, and the remainder either stood or sat on mats or stools. 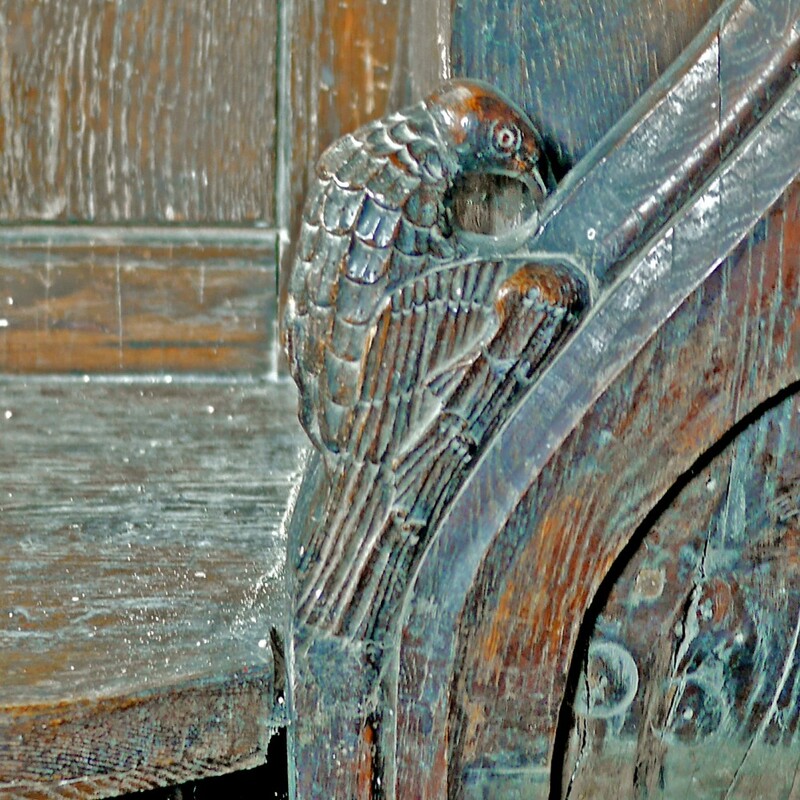 The normal pews date back to 1845 with poppy head carvings. 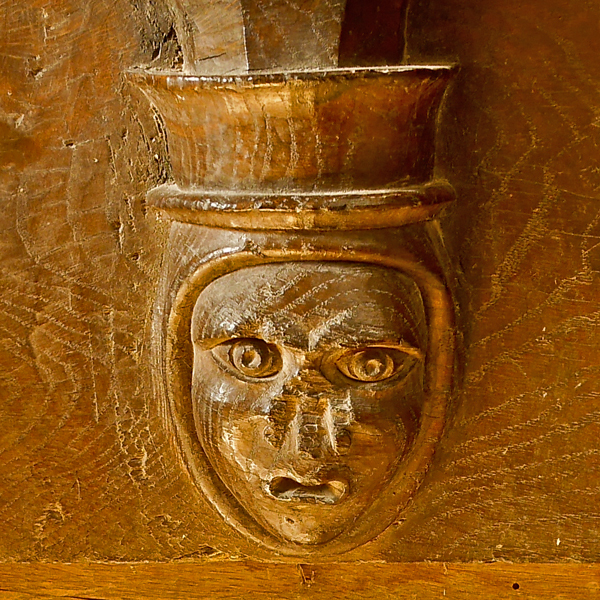 The poppy head is not named for the poppy flower, but is apparently derived from the French word "poupee," meaning doll or puppet . 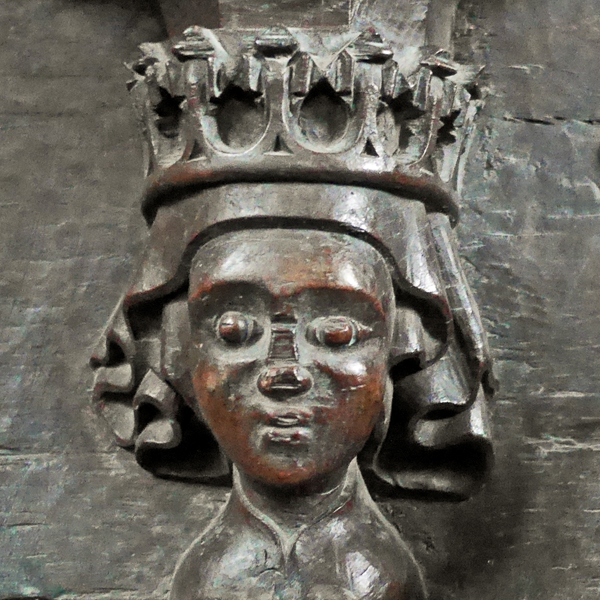 In most cases the poppyhead is not a head or a doll's head, but usually, in the churches of East Anglia, it is in the shape of a fleur-de-Iys or trefoil, consisting of foliage or leaves. 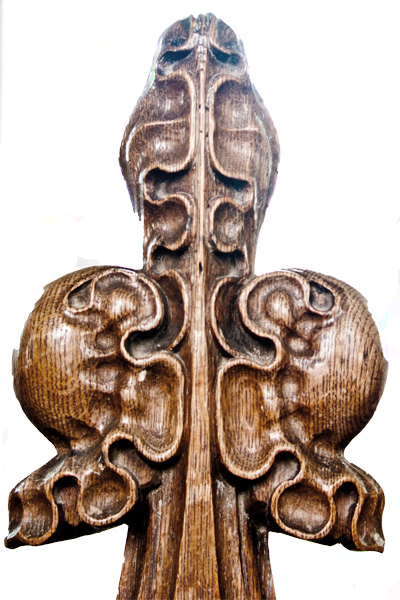 Some are "erect in appearance with three limbs pointing upward. 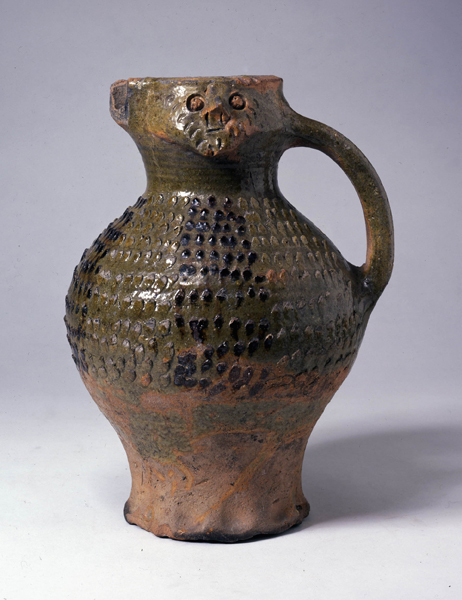 Others are broad-shouldered and horizontal looking". 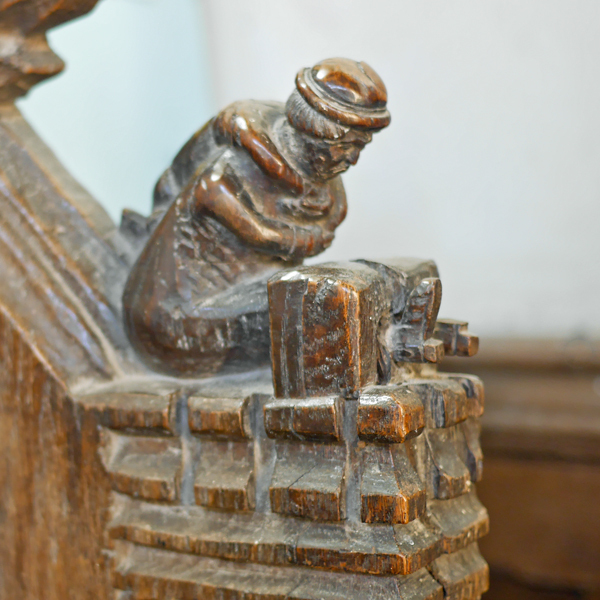 The poppyhead is placed at the top of the bench end and would sometimes have a hole in the top to hold a candle. 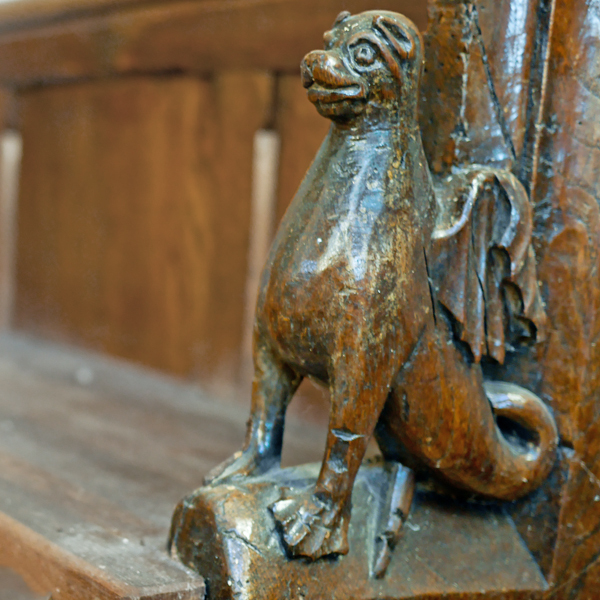 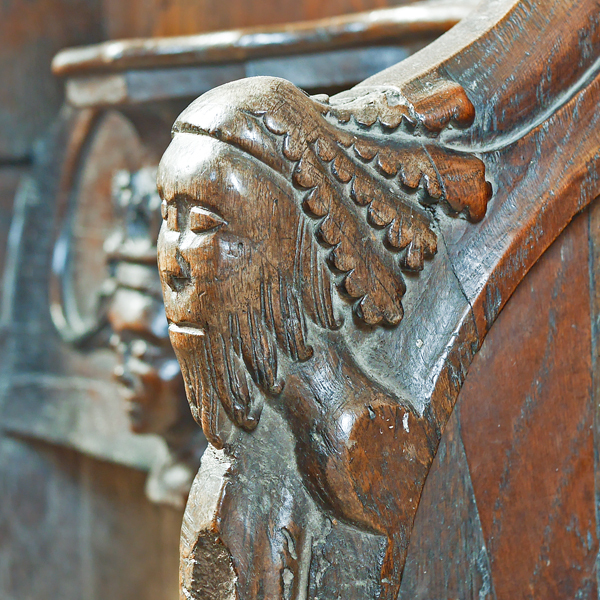 Some of the pews at St Botolph's though date to the 15th century and have a fabulous array of bench and pew carvings. 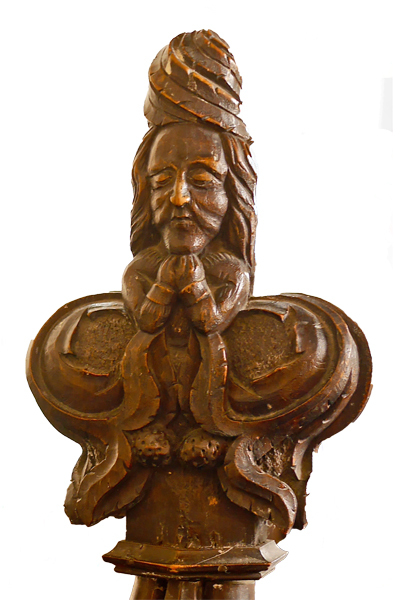 Because literacy was low in many rural areas of the country in those days, other means besides literature were needed to instruct the "common man" in religious matters. 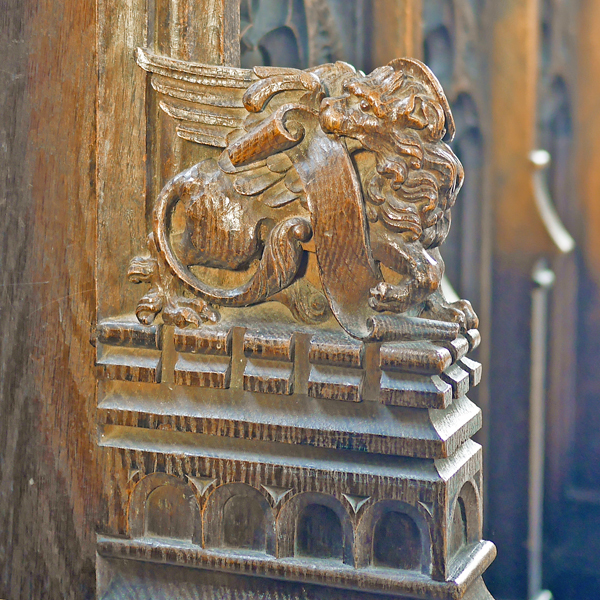 This was the case for these carvings and, of course, for stained glass windows. 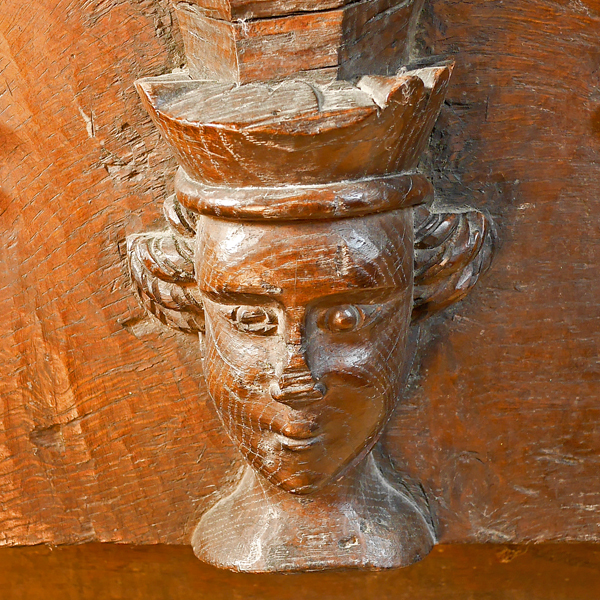 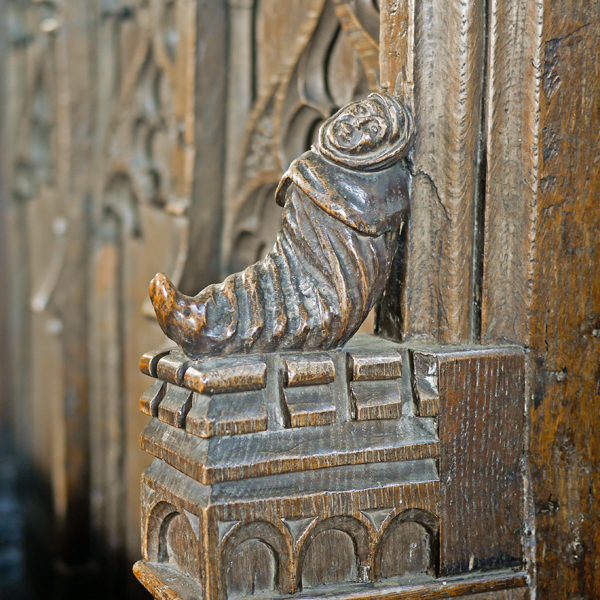 Perhaps because St Botolph is the patron Saint of Wayfarers, there are the most wonderful carvings from far away places and mythical creatures. 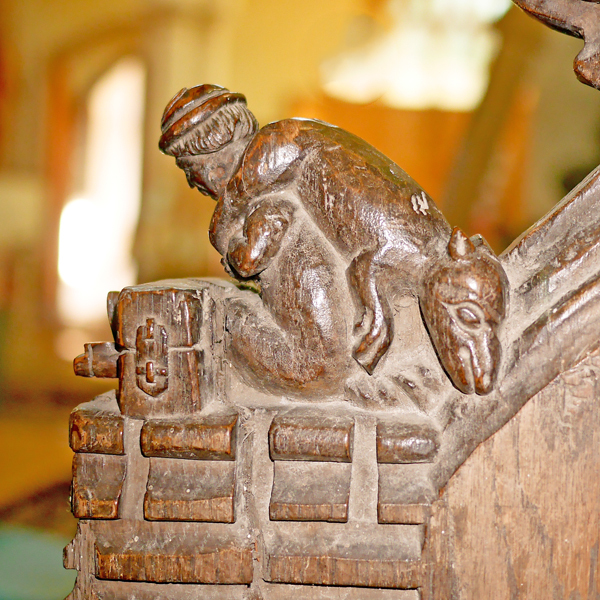 These include various birds and animals but also the man in the stocks - perhaps for stealing a pig, and the liar having his tongue pulled out & a "Dog with a Goose." 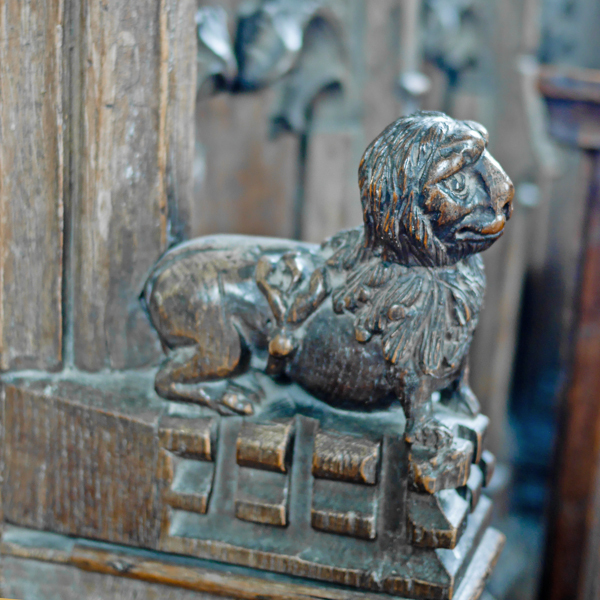 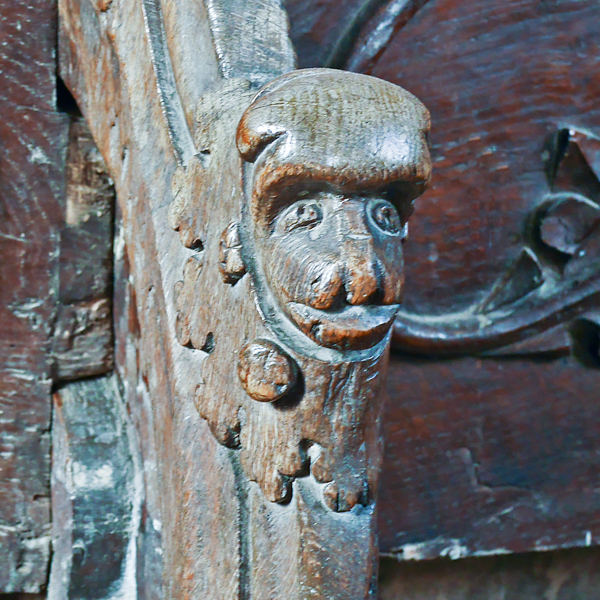 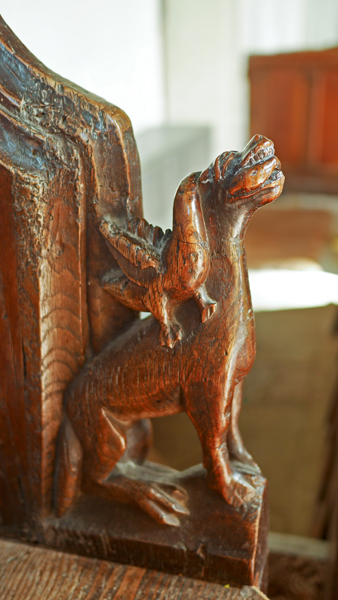 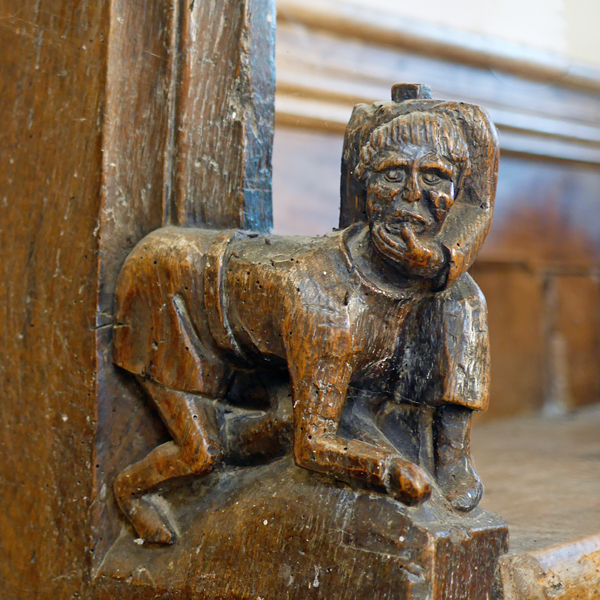 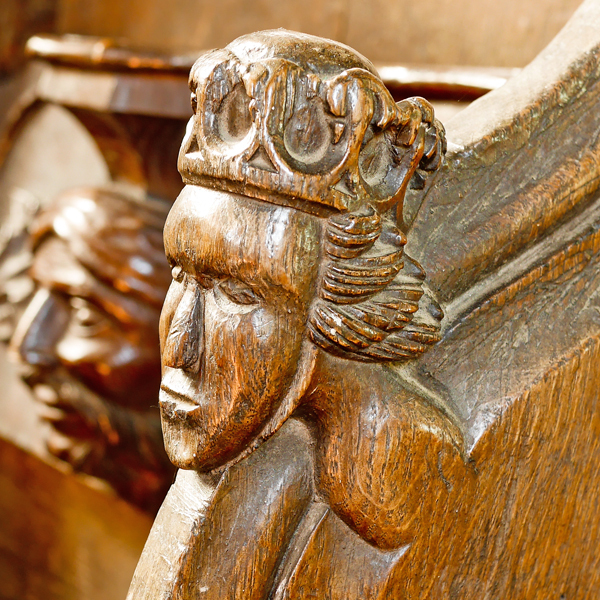 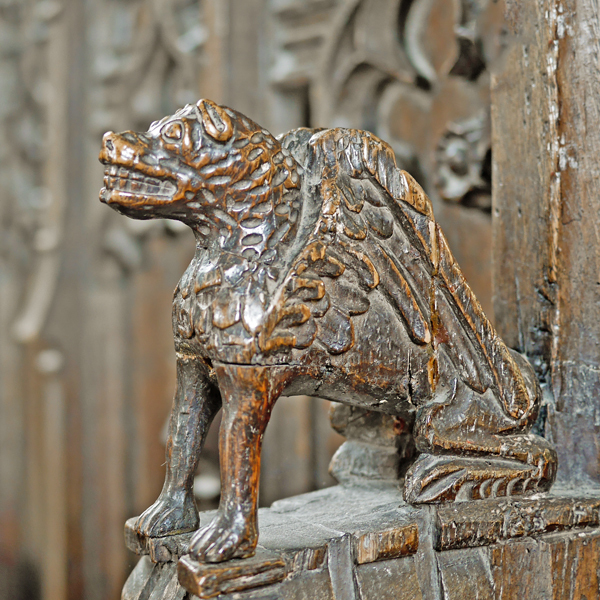 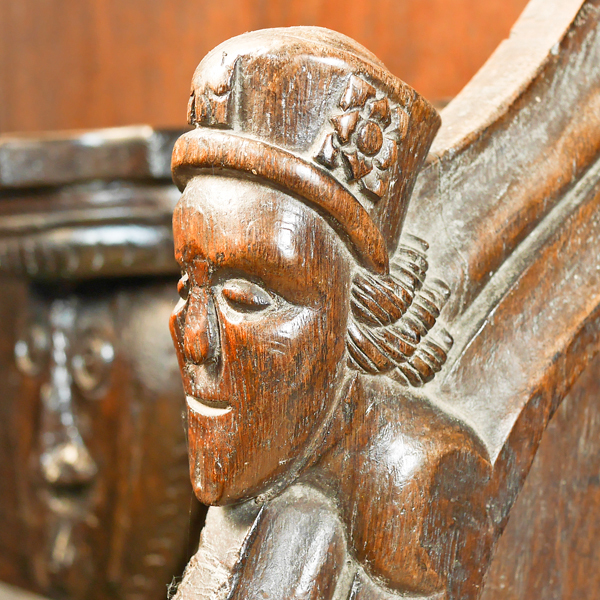 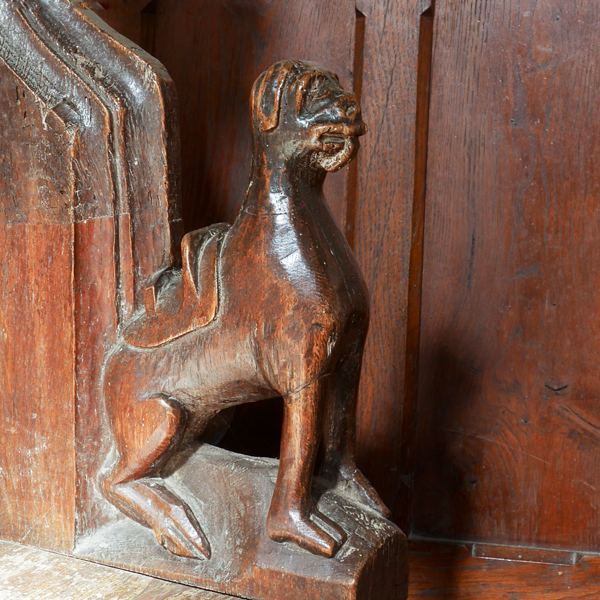 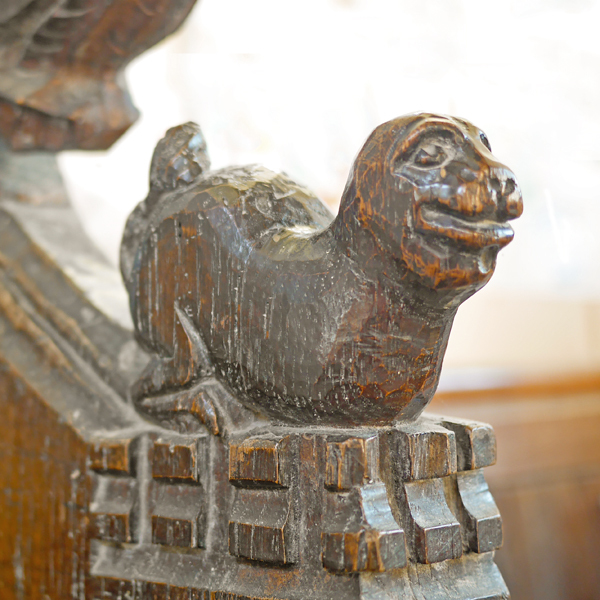 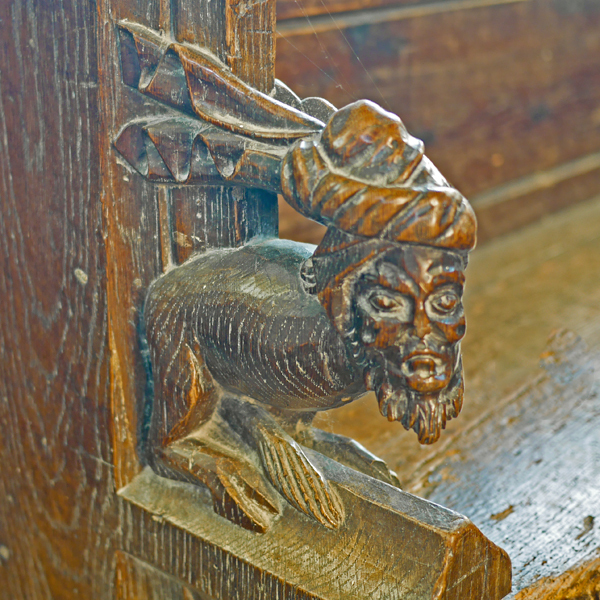 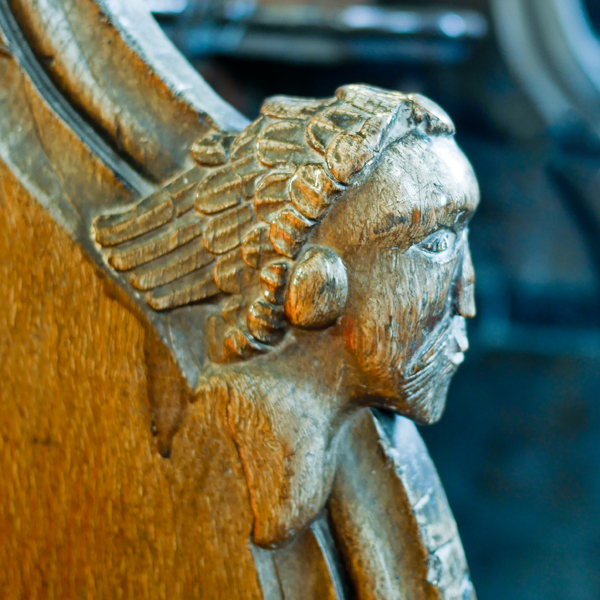 In the Chancel, you will find some fine carvings under the misericords (the tip up seats that make standing a little less tiring). 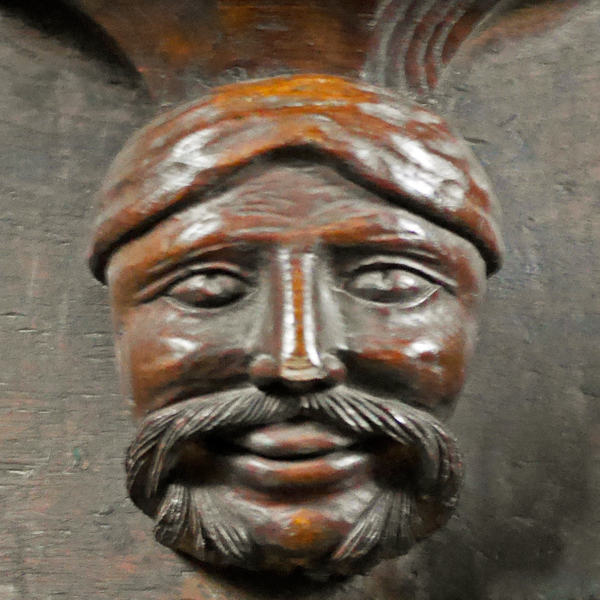 Four are from the medieval period, whilst the moustachioed man is a Victorian replacement and one was carved in 2006 by Norman Kershaw of Anglesey, copying a Grimstonware pottery face from the 14th century. 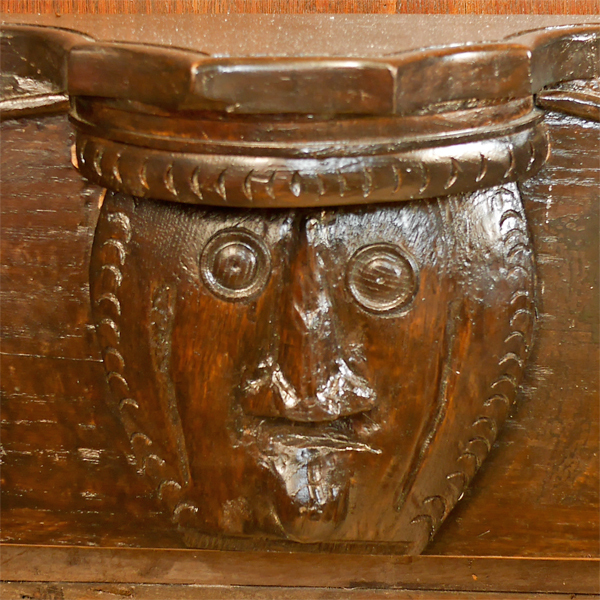 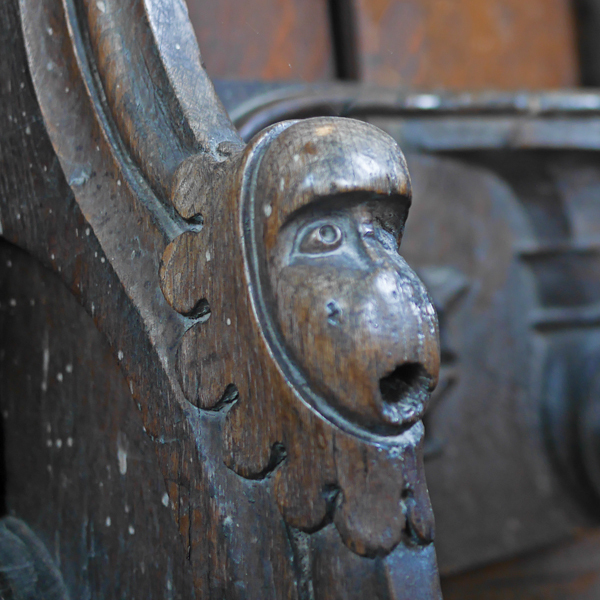 In the Chancel stalls, notice too the monkey heads and the woodpecker at each end & the carvings between the seats include a "Green Man" with leaves around his head. 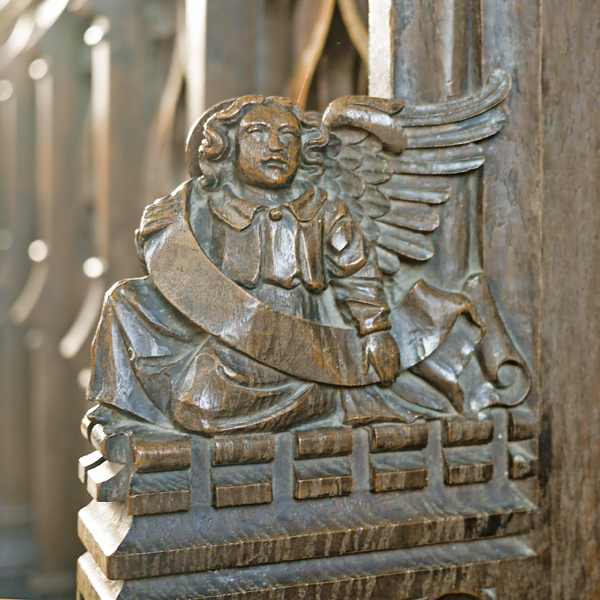 The second set of Choir stalls are Victorian, when a smoother surface could be produced on the ledges. 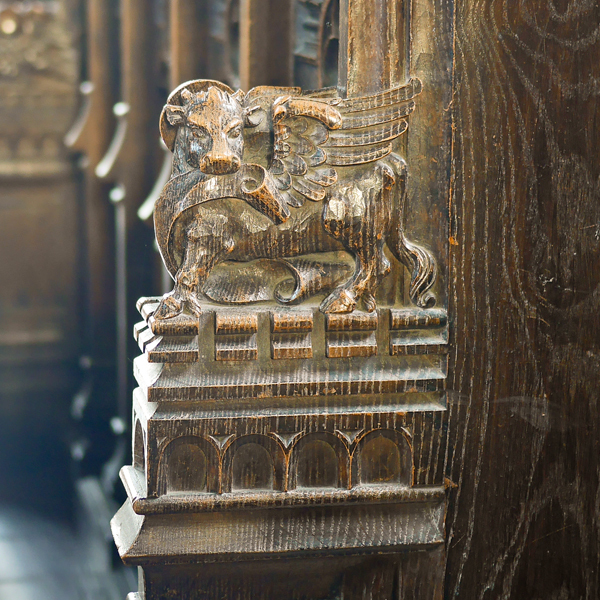 The late 19th century carvings feature the lion of St Mark, the bull of St Luke, the eagle of St John and the angel/messenger of St Matthew. 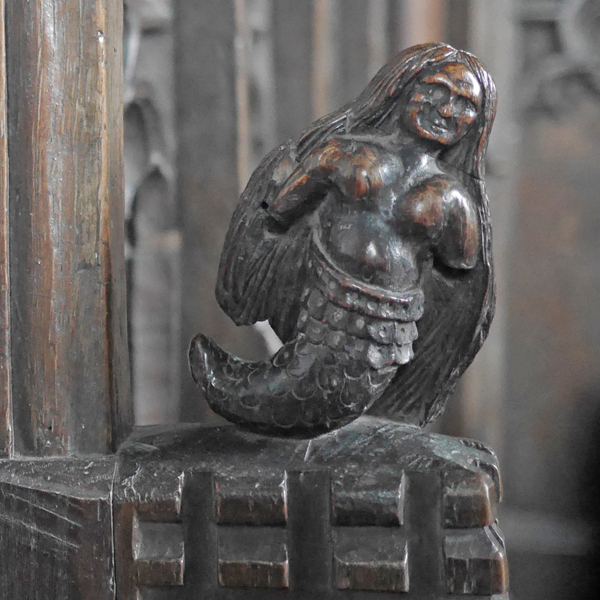 The medieval stalls feature a lion, a poor man, a dragon and a mermaid.